Hope everyone has had a great start to the new year? I'm busy working on some new designs for the Crystal Iced website, which means new products will be added soon! The website will be closed from around the end of May, for roughly 2 months, as I will be on maternity leave (baby no 2 :) However if anything is required urgently, please feel free to get in touch via email or leave me a message and I'll see what I can do for you. In the meantime, I'm running a new competition on Facebook and Instagram, to name this quirky new unicorn design. 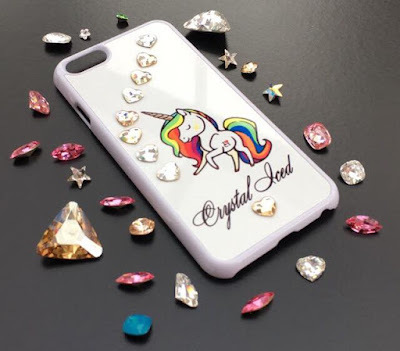 Winner will win the iPhone 6 phone case and Swarovski charm. UPDATED: This design was named Unicorn Kisses and name was suggested by Lyndsey Walton, thanks so much!